The Model 233-P single-phase Pump Saver Plus is a pump monitor designed to protect single-phase pumps from dry-well, dead-head, jammed impeller, rapid cycle and overvoltage and undervoltage conditions. The Pump Saver Plus Model 233-P protects 230 volt, 2 or 3 wire, 1/3 to 3 hp pumps. A calibration adjustment allows the Model 233-P to be calibrated to your specific pumping applications, thereby reducing the possibility of false or nuisance tripping. A proprietary microcontroller based voltage, power factor and current-sensing circuit constantly monitors for power fluctuations, overcurrent and underload conditions. When an abnormality, such as loss of suction, is detected, the PumpSaverPlus deactivates its output relay and directly disconnects the pump motor. The PumpSaver®Plus then begins its user-selectable “Restart Delay” (dry-well recovery) timer. When the timer expires or power is removed and reapplied, the PumpSaver®Plus reactivates its output relay and turns the pump back on. The PumpSaverPlus models have a sensitivity adjustment for the dry-well trip point. 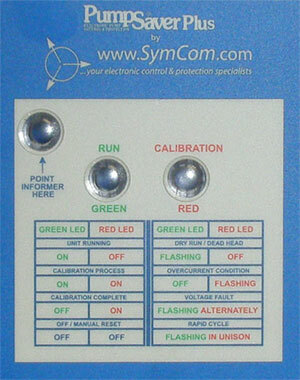 After calibration is done, you can adjust the sensitivity for the dry-well/dead-head trip point from 70-90% of the full load. This makes the unit even more adaptable to varying pumping applications. If you have a very low producing well, you increase the sensitivity closer to the 90% mark, or if you have a very heavy producing well, you would decrease the sensitivity around the 70% mark.